10 Paisa. Reconstructed sheet of two. The 1920 issue was re-issued in 1921 for the 2nd Anniversary of Independence. 30 Paisa. Reconstructed sheet of two. 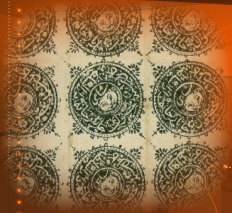 10 Paisa, used during the reissue for the 2nd Anniversary of Independence, postmarked Kabul , dated Zou'ihajjeh 1339 = August 1921, which is very early. 10 Paisa, complete used sheet. Used on small piece from Kabul to Kandahar. The reverse (not shown) has part of a registration tail, indicating that the franking was probably 10 paisa postage plus 10 paisa registration.